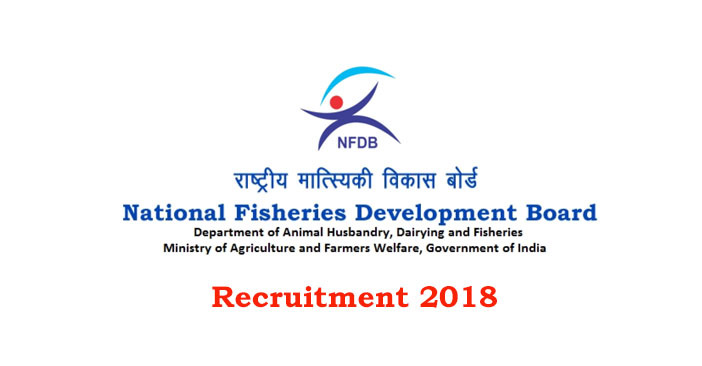 Government of India, National Fisheries Development Board (NFDB), Hyderabad (Telangana State) invites applications for recruitment of following Group ‘B’ posts in NFDB. Apply within 30 days from the date of publication of this Notification in the Employment News Paper 03 – 09 February 2018 Issue. (1) Bachelor’s Degree in Aquaculture/ Zoology / Fisheries or Bachelor in Fisheries Science (B.F.Sc). (2) Desirable – 2 years field work in fisheries or related development/ research activities and possession of knowledge of computer, including Excel, MS-office, power-point presentation etc. (1) Bachelor’s Degree in Arts/ Commerce/ Statistics Bachelor of Business Administration (BBA), Bachelor of Computer Application (BCA). (2) Desirable – 2 years experience in data processing, possession of knowledge of computers, including Excel, MS-office, power point presentation, Tally etc. How to Apply: Interested candidates may submit their Applications in the prescribed Format, along with self attested copies of all the certificates in proof of educational qualifications, age, experience, caste, etc. so as to reach, The Chief Executive, National Fisheries Development Board, Near Pillar No. 235, PVNR Expressway, SVP National Police Academy (Post), Rajendranagar, Hyderabad – 500052, within 30 days from the date of publication of this Notification in the Employment News (i.e. Last date will be 05/03/2018). The envelope containing the Application should be super-scribed as ‘Application for the post of Executive Assistant (Technical)’ or ‘Application for the post of Executive Assistant (Finance and Administration)’.